Another day, another tabloid reporting on some fictional 'fury'. This time it was the Daily Star and a claim that a video game based on Raoul Moat was being planned, called 'Grand Theft Auto: Rothbury'. Having seen the mocked-up cover somewhere, the Star seems to have believed it was actually going to be made. The Star even appears to have a quote from the sister of Moat's ex-girlfriend, who says the game is 'beyond belief'. Of course it is. So how did 'journalist' Jerry Lawton and the people at the Star even begin to think this was real? By this afternoon, the Star had hastily removed the story but the folk at MCV had taken this screenshot of it. Tim Ingham from CVG wonders if the removal of the article was because they realised (finally) it was nonsense, or whether Grand Theft Auto publisher Rockstar Games had had a word. How on Earth can anyone (never mind British newspapers) be so utterly guillible? Didn't the editor or sub-editors ,for one second, question this story? It's so obviously made up even Viz magazine would think twice about printing it. This was a joke image made by an infamous message board, that shall remain nameless. This is as funny as the I-Dosing article in the Daily Mail! Do the journalists actually bother researching nowadays? "Fury", "Row", "Storm" - words that always signify a desperate journalist with space to fill. The fury, row and storm is always in a made up non-place between the authors ears. Still I expect we shall shortly read that Northumberland County Council has banned this game on the grounds that it will offend Muslims, while the school in Rothbury will be the subject of a petition to try and stop it teaching this game as part of its media studies course. This reminds me of an April Fool's joke from about ten years ago. In its April issue, PlayStation Plus magazine ran a preview of a fake ultra-violent game called Scum, in which players were rewarded for viciously slaughtering innocent people. This was picked up by the Star, who ran the typical 'fury' and 'outrage' story. Given that this fictitious game was entirely made up by PlayStation Plus, it was clear that all of the images used by the Star had been lifted directly from the magazine without permission. The Star even got a couple of rent-a-quote MPs to express their dismay. Of course, had the reporter bothered to call the phone number featured on the 'advert' for the game before running the story (conveniently located right next to the preview), they would've reached the magazine's office and informed that they'd fallen for a prank. According to that, the government based its policy on housing benefits in the recent budget on stories read in the Mail and the Sun! 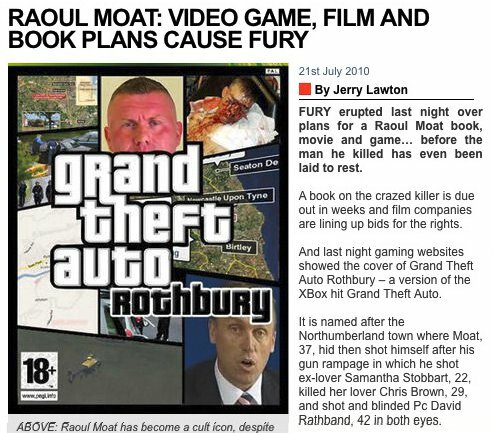 Disgusting - glorifying a killer by writing a book about him and spoofing the GTA cover. The good, moral, British, moral, wise Daily Star would never glorify Moat by repeatedly writing half-baked stories about him for weeks after the event, now, would they? "According to that, the government based its policy on housing benefits in the recent budget on stories read in the Mail and the Sun!" Not only housing benefits. Cameron also made a speech about "elf'n'safety reform where much of it seemed to be based on the half-truths and lies espoused by the likes of the Mail and of Littlejohn. There's more to this story than the newspaper piece. The unapologetic hack then decided to deride his critics on his Facebook page.